Emerald Bay, Lake Tahoe, USA. Credit: R.A. Schweickert et al. Emerald Bay, California, a beautiful location on the southwestern shore of Lake Tahoe, is surrounded by rugged landscape, including rocky cliffs and remnants of mountain glaciers. Scenic as it may be, the area is also a complex structural puzzle. Understanding the history of fault movement in the Lake Tahoe basin is important to assessing earthquake hazards for regional policy planners. The Lake Tahoe region is rife with active faults, many of which have created the dramatic and rugged landscapes. The Lake Tahoe region lies between the Sierra Nevada microplate to the west and the Basin and Range Province to the east. Northwestward movement of the Sierra Nevada microplate creates stresses that may produce both strike slip (horizontal) and vertical movement on faults. For years, geologists have traversed the forbidding terrain around Emerald Bay, noting where faults cut the landscape, but a detailed picture of the faults was still missing. Two of these faults—the Tahoe-Sierra frontal fault zone (TSFFZ) and the West Tahoe-Dollar Point fault zone (WTDPFZ)—stretch along the western side of Lake Tahoe, but their continuity across landscapes and the nature of their movement has been debated for nearly two decades. Richard Schweickert, of the University of Nevada-Reno (UNR), part of a team of geologists and engineers from UNR, the U.S. Geological Survey, and Santa Clara University, said, "We found plenty of evidence for scarps (i.e., faults) that cut the glacial moraines all along the west side of Lake Tahoe, in particular around Emerald Bay." But it was what they couldn't hike across that most interested them. "We were desperate to see what's actually going on the bottom [of Emerald Bay]." The research team decided to examine the faults both "by land and by sea." 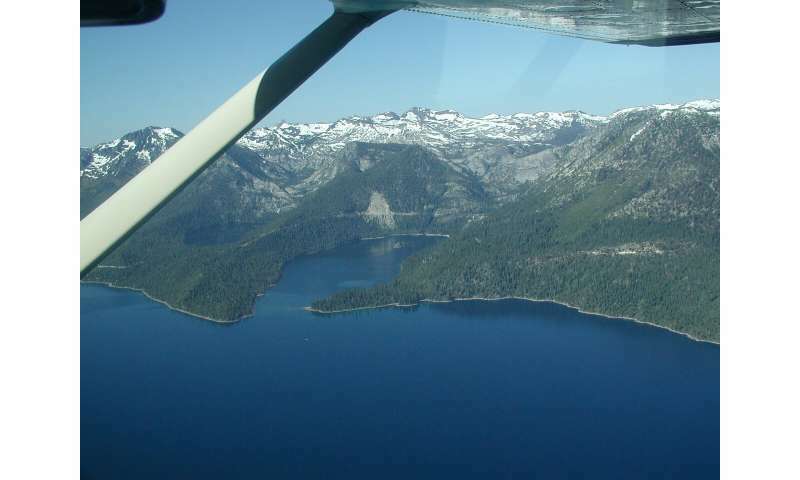 In a new paper in Geosphere, Schweickert and colleagues describe a number of deep dives that uncovered evidence for major faults on the floor of Emerald Bay. 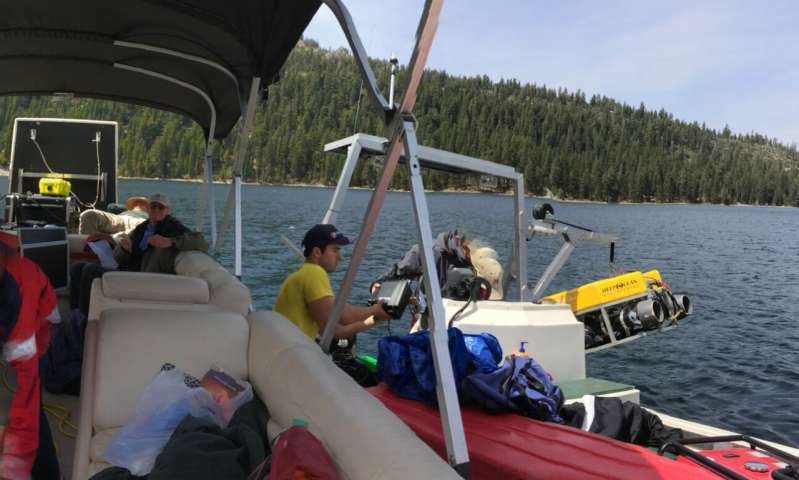 Using a remotely operated vehicle, or ROV, and previously published multibeam echo sounder imagery, the team created a detailed map of the bathymetry (depth and shape) and geology in Emerald Bay. The high-resolution bathymetry survey showed clear evidence of scarps cutting across submerged glacial deposits and lake sediments, along with landslide deposits that toppled into the bay after the glaciers melted. Based on the age of nearby moraines, Schweickert says the scarps in most cases are younger than about 20,000 years old. Emerald Bay, California, a beautiful location on the southwestern shore of Lake Tahoe, is surrounded by rugged landscape, including rocky cliffs and remnants of mountain glaciers. Scenic as it may be, the area is also a complex structural puzzle. Understanding the history of fault movement in the Lake Tahoe basin is important to assessing earthquake hazards for regional policy planners. Credit: R.A. Schweickert et al. The faults scarps in the Bay are very sharp, with steep faces sloping between 30 and 60 degrees—surprisingly steep for scarps that could be thousands of years old. "You would only see that steep angle on land exposures for faults that had just moved within the last few hundred years," Schweickert says, but noted the scarps were likely preserved by being underwater instead of being repeatedly exposed to running water on land. Schweickert says that the bathymetric data paired with direct underwater observations with the ROV show conclusively that the scarps are related to faults. "We've been able to produce the highest resolution maps with the greatest amount of detail of anywhere in the Lake Tahoe Basin," he added. After studying the ROV, bathymetry, and LiDAR data, the team noted that over the past 20,000 years, the TSFFZ and WTDPFZ were moving vertically, with no strike slip motion. Schweickert says their discovery was a bit of a paradox to what might be expected in the Lake Tahoe basin. Ten to 15 years of satellite GPS measurements show a northwest movement for the Lake Tahoe region, relative to the interior of North America. But the TSFFZ and WTDPFZ don't reflect that direction of movement—at least not recently. "I think this shows us that the GPS data really doesn't tell us what the faults themselves are doing on a local scale," says Schweickert. "They do their own thing." He adds that scientists studying other faults in the Lake Tahoe area have reached similar conclusions. However, Schweickert notes that landforms around Emerald Bay, thought to be roughly 100,000 years old, look like they experienced right lateral, strike slip movement sometime in the past. "Faults can move in different directions over long periods of time," he says. "Just because we see some them doing something right now doesn't mean that they didn't have a more complex history in the not too distant past." "There's more to this story that still needs to be known," says Schweickert, and notes that studies like theirs have value for policy and planning.